A natural focus I have when I first arrive in a new position or place or situation is to Look - Listen and Learn. This is probably an approach most people use, yet most of us fail to articulate it into words. This is certainly an approach I am using leading into the next phase of my learning to lead journey. A general observation I have noted is that the strategic focal points of, consultation, shared ownership, distributed leadership and transparency are often missing in schools. Many school systems still operate within a hierarchal system, leading from the top down where staff are told rather than empowered to get involved, and therefore students wait to be told rather than empowered to get involved. My first step was to gather voice on WHY we are here? What is the VISION for our school? People knew bits and pieces of the existing vision but there was no collective understanding. This provided my first focus of change with a need to redefine - Why are we here? Why our school? We unpacked the existing Vision statement and put it back together by Keeping It Simple Memorable Easy - KISME. This was really excited. 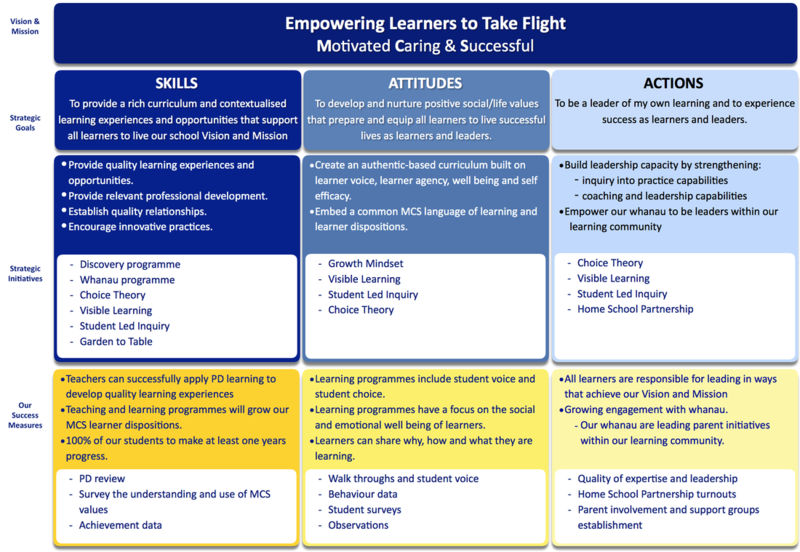 We were starting OUR learning journey together modelling our new Vision statement: Empowering all Learners to Take Flight. Our next step was HOW? How do we do this? Quite often I heard our student community shorten our name to MCS. Who are we? MCS. This provided the perfect platform to build our HOW. Our next step involved more than our previous approach. It required a complete mindset change. We needed to learn and understand growth mindset in order to model it and implement it within our immediate school community. Therefore our WHAT became specific actions based on unlearning, learning and re-learning. What is it we want children to do to show Motivation Care and Success? These have become our Strategic Goals - WHAT are our goals and WHAT will we do to achieve our goals? changing our staff mindset, where staff were expecting to be told rather than involved. Growing engagement with our whanau where our whanau are leading parent initiatives within our learning community. SKILLS - Providing the skills and knowledge by creating Motivating learning experiences and opportunities through noticing our DREAMs, DARING to seek and plan, then take cation through DOing. ATTITUDES - Developing and nurturing positive social and life attributes through Caring about ourselves, Caring about others and Caring about our environment. We need to understand that the future of education is changing rapidly. What we prepare for, what our student need to be prepared for is vastly different and unknown. We are no longer preparing students for something - We are needing to prepare our students for anything. We will know we are successful when we hear, see and feel it.